Upgrade Your iPhone Camera With ProCamera + Giveaway! If you’re looking for an iPhone camera app that packs an amazing number of features, some of which you may never even use but are nice to have, check out ProCamera in the App Store. The great thing about ProCamera is the abundance of features included in the app. The app delivers intuitive and fast control for all of its features, making ProCamera both fun and easy to use. The AntiShake stabilizes camera shots so that users get the sharpest photos possible in any situation. While I’m not taking super shaky shots in my daily adventures, the AntiShake feature definitely cleans up photos. This features expands the iPhoneâ€˜s photo zooming capabilities with a 6x zoom. While photo zoom is quite bad on the iPhone, it looks better when using ProCamera. This is a great feature as it enables users to set a timer so that group shots or self-shots can be easily done. This feature allows users to avoid crooked pictures and videos. Multi Shot is great for panoramic or collage photos! The feature enables users to snap photos one shot after the other. While I don’t use this feature often, the Fullscreen Trigger is handy. It enables users to tap anywhere on the screen to capture a photo. This is great for those quick, unexpected photo opportunities. Aside from the aforementioned features, the app also includes an “Expert” mode that gives users separate focus and exposure controls for both photos and videos. Any adjustments are locked-in so the iPhone can be moved without readjustment. The white balance feature also has a similar locking function. 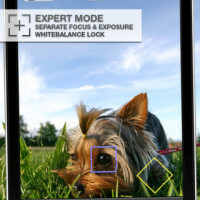 The white balance can be locked-in to a specific color temperature with one tap. For photo editing, ProCamera includes three tools: ProFX, ProCut, and ProLab. ProFX enables users to apply various filters and effects with a single tap. 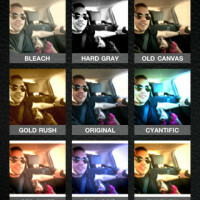 The app also includes a good variety of filters so users can get creative. ProCut enables users to cut, crop, and rotate photos. The feature even lets users choose a ratio preset to quickly frame the photo to a specific size. The feature is handy for creating avatars or other small photos. 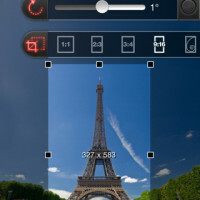 ProLab enables users to manually adjust the brightness, saturation, and contrast settings of photos. ProLab also includes auto-adjustment features and scene modes to further enhance photos. Lastly, similar to the iPhone Camera.app, photos taken by ProCamera contain useful information such as time, date, location, and compass direction. The data is hidden in the photos and can be seen in the ProCamera app with satellite maps showing where photos were taken. Overall, ProCamera is a powerful and fantastic camera app. If you need more power and function than what the stock iPhone Camera.app can deliver, check out ProCamera! ProCamera is available, on sale, in the App Store for $1.99. Today I have FIVE copies of ProCamera to giveaway to iPhoneinCanada.ca readers! Throughout the day, I will drop the five codes into the comments below. Be the first to get one to win! 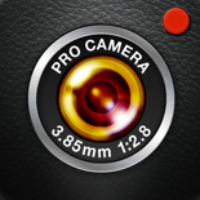 But, before we begin, what do you think of ProCamera?